Things got crafty up in here yesterday. Just a simple DIY that passed a few hours in the afternoon and got me in the mood for cooler weather and crisp leaves on the ground! 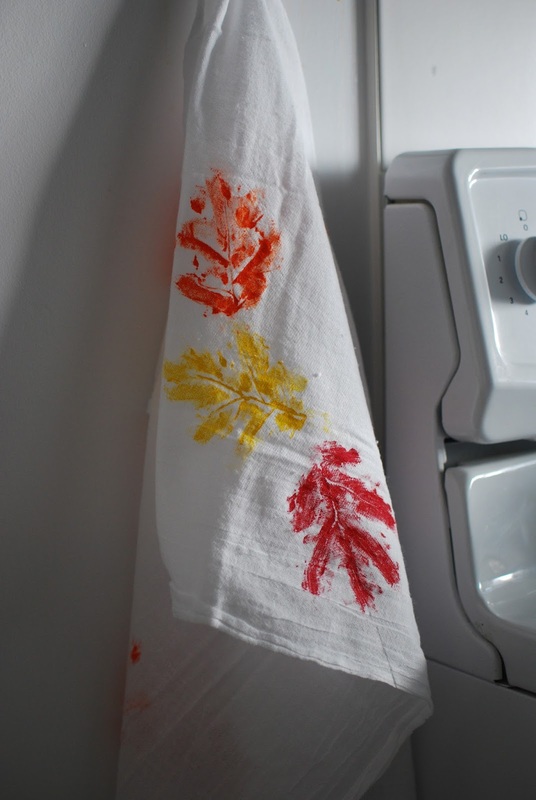 A few freshly ironed flour-sack tea towels, your favourite fall colours and some leaves from a garland/wreath thing and ta-da, there you have it, stamped tea towels to kickstart a new season of deep reds, oranges, and shades of yellow. I got the idea from this YouTube video where she made a print by stamping citrus fruit which is super cute! Since the summer season is winding down whether we like it or not, this is a bit more appropriate to embrace the cooler temperatures. Five tea towels later, I've got some padded envelopes to stuff and some notecards to write before I send these off to a few friends to help welcome this time of year. I'm hoping to experiment with the DIY-type things more throughout the fall and winter. We have a chair that needs reupholstering that I'm considering tackling myself rather than taking it to a professional, plus a few other things to add to our little space. This morning I made pastry from scratch, so watch for what the results were from that later this week! As for now, I'm off to make pizza dough for dinner! Until next time, happy making! it's nice to read your entries-- i miss your presence on Livejournal but i'm happy you're still blogging in some form. that's a neat DIY project and a cool thing to receive as a gift.